This year the rains came early, starting the day after the men came to begin stripping and resurfacing my roofs. The day after they were supposed to remove the skylight, hurricane-force winds and torrential rains made me glad for once, that they had been no-shows. A month later, the repairs are over and we’ve settled into the daily or nightly showers. I am snug in my house and the mountains behind me are covered with a vivid green. Soon water will be shooting in rivers down the arroyos and cobblestone roads that lead down to the lake from my house and every teja will serve as its own channel for individual rios streaming down from my roof into waterfalls that will arc down to the terrace tiles below. This entry was posted in Form Poem, Poems, Poems about rain, Rain, Rainy Season, Uncategorized and tagged form poem, form poetry, haibun, poems about rain, rain, Rainy Season on June 25, 2018 by lifelessons. They can’t control the weather. The rain is its own boss. So in the rainy season, we get our share of moss. but in the rainy season, it grows inside my shoes. and then in the morning, we wake up to it again. Our clothing’s always soggy. Our clean cars do not last. We can’t sit on the patio for a light repast. for when we do, our touchdowns wind up as muddy skids. and when we order pizza, the box is always soggy. Pent up with our families, tempers sometimes flare. Dad wigs out when the roof leaks, sis bemoans her frizzy hair. that the wifi doesn’t seem to work so well when it is raining. We know the flowers need it, as does the reservoir. Restrictions in water usage in the summer are a bore. but is there no way to get it without getting wet? The FOWC challenge word today is control. This entry was posted in Humor, humorous poem, humorous poetry, Poems about rain, Rain, Rainy Season, Uncategorized and tagged FOWC, humorous poetry, poem about rain, poems about rain, rainy day, Rainy Season on June 12, 2018 by lifelessons. It is an Armageddon of storms. The local weather site records two hundred strikes of lightning per minute at its height. At first long jagged snake strikes, then two house-shaking claps of thunder and sheet lightning that seems to surround my house. I worry about my two tall Edwardian palms—the highest things anywhere near me. Just yesterday I called my tree guy to tell him I think they are dying. The palm beetle has made its sinister way into our area and since I’ve just had all my palms trimmed, it has crossed my mind that perhaps the tree cutters brought them with them on tools or clothing. It was a few days after they left that huge chunks started to fall off of the trunks and the fronds, green a few days ago, started to turn yellow. Just a half hour ago, before the wind and the first claps of thunder and stabs of lightning and initial raindrops had hit, I had wondered when the next big chunk of tree would fall. At that exact instant, I heard a loud slapping bang as another chunk fell. As though in concert, the first tympani of thunder sounded, the wind came up and I heard the first spatters of rain against my skylight high above me on the dome of my living room. Then my whole word was suffused by light and the crack and long roll of thunder as one peal of thunder ran into the next in one long colossal drum roll. The rain pelted down and a high thin wail of wind seemed to whistle around something high up on my house. All rounded corners, there is little sharpness to catch the wind. It is the first time in the 17 years I’ve lived here that I’ve heard this keening banshee whine that I thought I’d left behind me in Wyoming thirty-seven years ago. It was the Mariah of winds, a weather horror story that didn’t fit in here in Mexico, and as though it knew it, after two spine-chilling entwining moaning shrieks, it disappeared. The night, black and starless, lit up repeatedly, as bright as daylight, like giant flashbulbs going off. The two nearly denuded Edwardian palms stood out starkly against the white sky. “Take a picture,” my Skype friend demanded, and suddenly, my formerly lost camera appeared as if by magic in front of me. Thirty-one times, I tried in vain to capture the lit-up sky. Thirty-one times, I caught only the neighbor’s porch light against a pitch-black sky. Then, on my thirty-second attempt, when the sky flashed white and then black again, the whiteness remained frozen on my camera screen. I had caught it! An hour after the first clap of thunder, the storm has abated. My house forms some demarcation line as I can hear rain still steadily falling on the front terrace, whereas there is no rain at all on the back terrace or yard. The thunder has stopped. The lightning has been clicked off. Once again I can hear the whir of my tiny desk fan. The dogs lie curled in their beds, as unperturbed as they were even in the height of the storm. They are Mexican street dogs, accustomed to fireworks and the celebratory firing of guns into the air, to loud weekend parties in the houses across the street that stretch into the morning hours, to loud banda music and the air brakes of big trucks carrying gravel or boulders up and down the mountain. Only the sound of the clink of the cat dishes on the stone terrace as I feed them half a house a way could stir them from their beds. The cats are no doubt in an entwined pile in their large and cushy bed in the garage. All things around me: the storm, the cats and the dogs, have put themselves to bed and it is my turn to cease my consideration of the Armageddon that once again has threatened and then passed us by. All’s right with the night for now and that is as much assurance as we are likely to get in this world––a lullaby of sorts telling us its time to end the adventure for today and to sleep. One second it is night and the next it is day! Raining again. 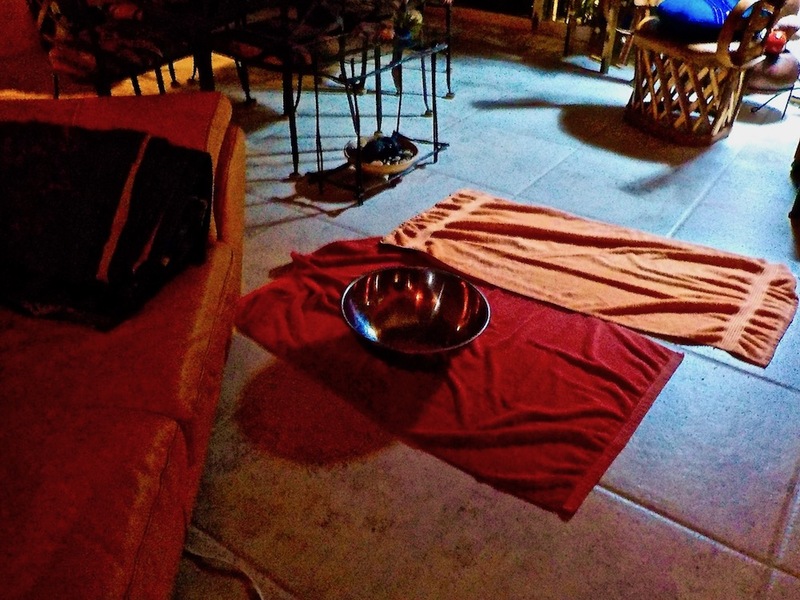 Furniture moved away from the leaks, towels and bowls out in danger areas. 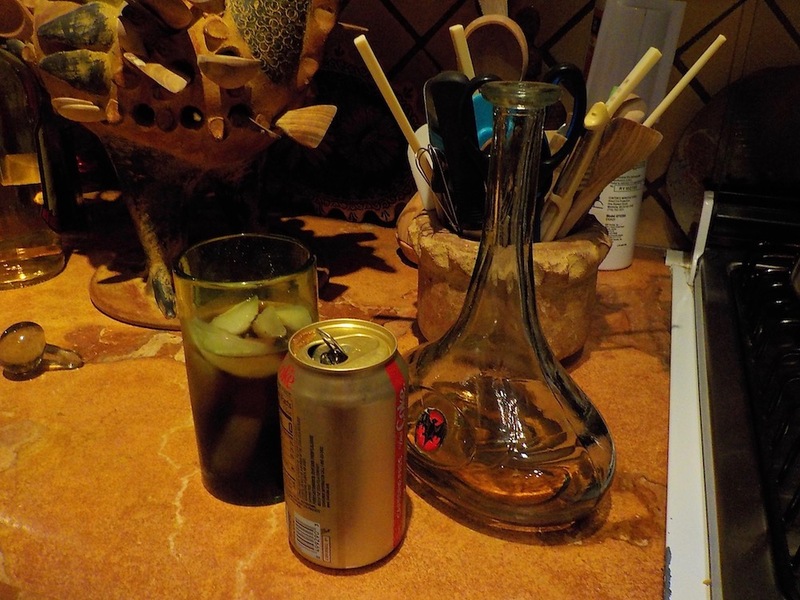 Time for a Rum and Coke, and bed. This entry was posted in Rain, Rainy Season, Weather and tagged Rainy Season, Stormy Weather on May 8, 2018 by lifelessons. to prod and follow everywhere the British nation goes. Then when it gives up teasing them, sun does not come again. Fog merely slips aside a bit to make room for the rain. So button up your raincoat. Invest in rubber boots. and dampen down your spirits if your wet clothes aren’t enough. not solving any hunger. Feeding no appetite. soaking up your stockings and limping down your hair. when rain commences soaking you and fog takes up its stalking. it will not be enough to wear some flowers in your hair. to serve the use they’ve earlier served in months less wet and boggy. There’s no other solution when London life turns froggy! while wandering lost through rain and fog in an unknown sector. believe it when I say to you, it’s best to take a cab. This entry was posted in Poems about rain, Rain, Rainy Season, Uncategorized and tagged Daily Post, Daily Prompt, fog, London, poems about fog, poems about London, poems about rain, Poems about rain and fog in london, rain on April 20, 2016 by lifelessons. and once in the kitchen. have been coming in threes. over the low metal bench beside the hot tub. to find the heavy husk fallen from the palm tree. hoping to escape the third fall. as we succumb to hard truths. The Prompt: Howl at the Moon—“Follow your inner moonlight; don’t hide the madness.” — Allen Ginsberg Do you follow Ginsberg’s advice — in your writing and/or in your everyday life? This entry was posted in After Midnight, Cyber Romance, Goodbye, Imagery, Leave-taking, Loss, Love, Love Stories, Metaphor, Poem, Poetry, Poetry by Prescription, Rain, Rainy Season and tagged Daily Post, Daily Prompt, Different Loss, Falling, Judy Dykstra-Brown, Judy Dykstra-Brown Poetry, Loss, love, moonless night, poem, Poems, Poetry by prescription, The Daily Post, Verse on October 3, 2014 by lifelessons. The Prompt: It was sunny when you left home, so you didn’t take an umbrella. An hour later, you’re caught in a torrential downpour. You run into the first store you can find — it happens to be a dark, slightly shabby antique store, full of old artifacts, books, and dust. The shop’s ancient proprietor walks out of the back room to greet you. Tell us what happens next! Caught short by the rainy season, I should have known better. Though I’d left home high and dry, I knew I’d soon be wetter. Defenseless in the downpour, I ducked into a store. Just to get some shelter, I rushed in through that door. though finding what I needed might be sort of tough. an umbrella just as old as him held up in his hand. he happened to be carrying a really big umbrella! I opened up my pocket book and located a fiver. Now I wouldn’t spend this day wet as a scuba diver! I found that I was actually in the same old bind. As rivulets of water ran down my head and neck. The purchase I’d just made, I found, would be no help at all. I hadn’t noticed that the shop was St. Vincent de Paul. The fault was no one else’s. I know it was mine, solely. I should have realized sooner that my purchase would be holy! This entry was posted in Daily Post, Daily Prompt, Puns, Rain, Rainy Season, recycling, Thrift Store and tagged Daily Post, Daily Prompt, Humor, humorous poetry, Judy Dykstra-Brown, Judy Dykstra-Brown Poetry, poem, Poems, Poetry, Poetry by prescription, Puns, rain, Rainy Seaso, The Daily Post, Thrift Store, Umbrellas, Verse on July 28, 2014 by lifelessons. and so the rain falls down. The dogs refuse to leave their beds. from pipes into the hot tub. from above and the cool air that carries it. for independence was not granted evenly around this world. this new country I found 13 years ago. The Prompt: It’s Your Party—Since many are marking their country’s “birthday” in the US today, we wanted to ask: How do you celebrate yours? Are you all for a big bash, or more of a low-key birthday boy/girl? This entry was posted in Different Worlds, Fourth of July, Poem, Poetry, Poetry by Prescription, Rain, Rainy Season and tagged Daily Post, Daily Prompt, Fourth of July, Independencia, Judy Dykstra-Brown, Judy Dykstra-Brown Poetry, Lake Chapala, Mexico, poem, Poems, Poetry, Poetry by prescription, Verse on July 4, 2014 by lifelessons.